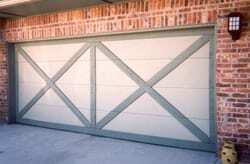 Home » Blog » Should You Paint Your Garage Door? If you are trying to decide whether or not to paint your garage door, there are a few considerations that you must keep in mind. This is one of the most important components to the attractiveness of your property, so you need to be extremely careful to do what it takes to keep it looking good. The professionals with Action Garage Door would like to allocate few information that can help make sure you get the job done correctly. You should obviously paint your garage door if it is cracking, flaking or peeling. By doing so, you will help keep rain, wind, heat and other elements from causing further deterioration. This is especially true if you have a wood door. You should also re-paint it if the door’s color has faded to the point to where it no longer complements the color of your home. If you have a metal door, however, it should already have an enamel finish that will last a long time. If you just want to change things up by changing the color, you need to remember that it will need to be maintained every few years. You also need to make sure you use the right paint so that you don’t run the risk of it washing off during a rain and staining your driveway. However, if the finish has worn off and there are portions of metal that are exposed, you need to take action so that rust does not occur. Make sure the color you use matches the front door of your home. This will provide a sense of continuity and provide an attractive counterbalance to the house. You should also match the color of your trim if possible. Match the color of your siding if you can to provide a balance to your home’s other architectural details. Of course, you may simply be better off replacing your garage door with a new model. If you have any questions, contact us online at Action Garage Door or call us at 972-215-7906.